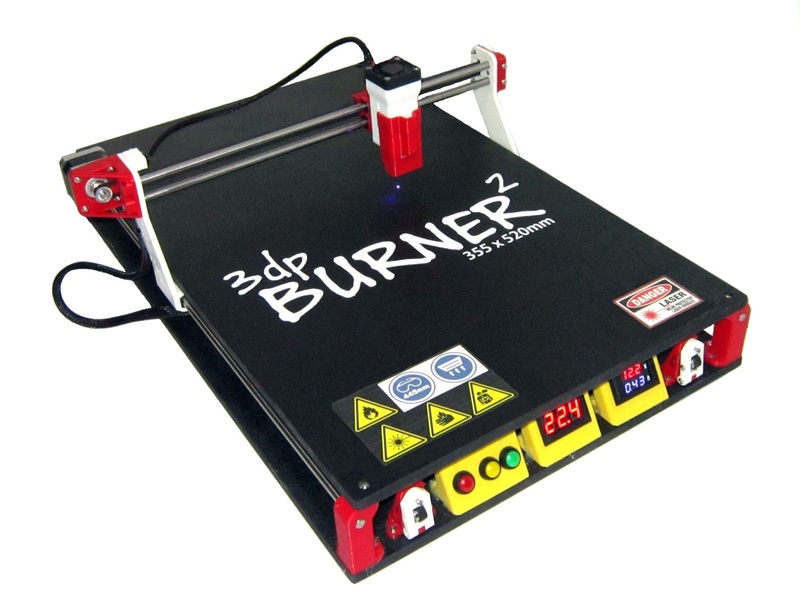 3dpBurner. 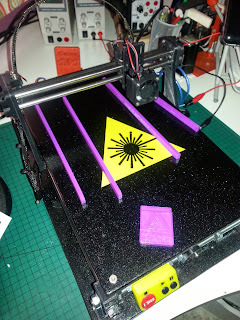 An Open Source 3D printed laser cutter/engraver. 3dpBurner is an open source laser cutter/engraver CNC machine. It is created with the same RepRap concept, by using 3D printed parts and some easy to find "vitamins" (non printed hardware). I tried to design as cheap as possible, by using comon electronics and a "low power" laser (a laser diode). The X/Y working area is fully customisable by simply cutting the rods to desired length. The max object height for working can be up to 50-60mm. 3dpBurner basically uses 3D printed parts, 8mm rods, M3/M8 hardware, some small bearings and a pair of GT2 pulley/belts. I got most parts from my "old" RepRap printer. Motion is controlled by Arduino UNO, a CNC shield and a pair of Pololu based stepper drivers for driving two NEMA17 stepper motors. The laser module is cooled by heatsink and forced air (small fan) and is drived by a constant current driver. Personally I'm using the popular NDB7875 1.6W blue laser diode (note this diode is sold as being capable of up to 3W when overdrived), but you can use your own diode (DVD recorder, BluRay, M140...). While 3dpBurner can be controlled by mostly GRBL based applications (gcode senders), i create a pair of Windows based ones. They provides an easy control and optimized gcode streaming for the GRBL firmware and also can be used for convert images to gcode files for gray scale engravings. - Improved design and PLA printing optimized. - Cheaper, easier and more rapid to assemble. - Less weight and a more compact design. For cutting some materials, mainly the high density ones >1mm like wood and some plastics, multiple passes are needed, this mean a slow process. The 3dpBurner can be used for engraving high quality real gray scale images, this can't be done with the common CO2 laser types due to their "high power" (these use the dirthering 1 bit method for create the grayscale effect). Materials up to about 3-4mm thickness can be managed ok. For more thickness, laser starts to unfocus considerably (all lasers), this mean laser beam has a bigger diameter and less concentrated energy. Some people asked about this laser for cutting bigger thickness wood or metal. While these laser types can cut some woods as mentioned, they are not recommended for these works due to slowly process. The common lasers used for cutting woods like the 5-10mm plywood are the CO2 type ones, and of course these are a more expensive equipments. In similar way, no any metal can be cut/engraved with these laser types (even, some times i use the thin cooking aluminium foil as base table protection when cutting!). For these works you should use other equipment like CNC milling, waterjet cutting, very high power laser... However you can apply a coating layer like paint or similar to these materials, by this way you can create engraved effect by burning the coated layer. NOTE: It is imperative you get the appropriate protection for your eyes and have a way to vent the toxic fumes released by the most of materials. The first thing you need to buy prior to applying power to your laser is a pair of safety glasses appropriate to your laser wave length. The laser spot or laser reflections can hurt your eyes very easily. Avoid using IR laser diodes as the beam is invisible but will still cause the same amount of damage as a visible laser. IR diodes are more dangerous as it is not obvious when they are switched on. *If you dont have a 3D printer, or any friend that can print parts or simply want to contribute with the project by this way, i can print them for you. Check here. *This site describes my own build, the purpose is to share my experience on this "personal cool project". I am not responsible for any injuries caused by this design/documentation. Use at your own risk and take care. Check and re-check your security and the environment prior to powering on the machine. *The documentation contained on these pages are related to my personal setup, if you use different parts (motors, controller, laser diodes, drivers) you must search info about them.